We are a mercury-free practice. However, many people still have silver/mercury fillings in their mouths from years past. These fillings aren’t aesthetically appealing, and we now know that silver/mercury fillings result in weaker tooth structure. Porcelain onlays/inlays and Tooth-Colored Restorations (composites) create fillings that are not only beautiful, but also add strength to weakened teeth. These restorations are aesthetically pleasing and very strong due to new bonding technology. Silver fillings have numerous drawbacks. The edges of the fillings will wear down, become weak or even break. This means that the tooth won’t be protected and lets cavities begin to form again. With age, silver fillings expand, contract, and can split. Silver fillings contain 50% mercury. They can corrode, leak, and cause stains on your teeth and gums. Fortunately, silver fillings can be replaced with Tooth-Colored Restorations. There are many advantages to Tooth-Colored Restorations. Resin icomposites are bonded to the teeth which creates a tight fit to the natural tooth. Such restorations can be used when much of the tooth structure has been lost. This allows the tooth to remain strong and intact. Since the resin used in Tooth-Colored Restorations contains fluoride, it helps prevent decay. The resin wears like natural teeth and does not require placement at the gum line, which is healthier for your gums. All of these benefits contribute to a beautiful smile. 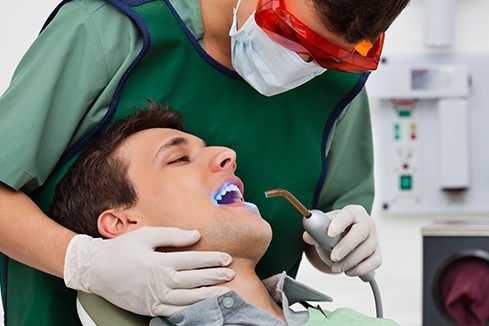 You can have your silver fillings replaced with Tooth-Colored Restorations. This process requires only 2 appointments. At the Lab: Porcelain is carefully placed into the model of your teeth. It is then designed to look completely natural. Your teeth are restored to a natural look and feel, they are stronger, and the tooth is protected.